Have you ever heard the origin-story of the teddy bear? The story goes that Teddy Roosevelt had taken a break from the Oval Office in the fall of 1902 to go black bear hunting in Mississippi. On the second day of the hunt, while the president was back at camp for lunch, the dogs cornered a bear and the hunting guide – wanting the president to have the honor of killing the bear – gave the beast a knock on the head, tied it to a tree, and summoned Roosevelt to return to the scene. Once Roosevelt got there, however, he couldn’t bring himself to kill it. 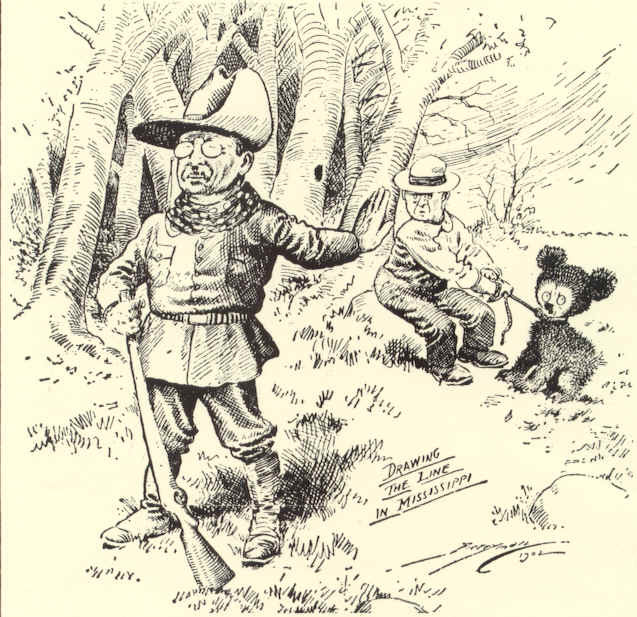 Now, the bear’s life wasn’t spared (it was killed by someone else in the hunting party) but the tale of Roosevelt sparing the bear lived on as a Washington Post cartoon depicting the president walking away from the option to kill the bear. “Teddy’s Bear” was thus born as toy-makers took the image of the sad, cuddly bear and created the now-iconic children’s plush toy. You can find Mooallem’s full TED talk about Roosevelt, the teddy bear, and his theory on conservation below but I think the take home point is this idea of “conservation reliance” and the sad and scary fact that so many species’ existence on planet Earth is based on whether we humans care or not. Not just on whether we put the gun down, as Roosevelt did, but on the stories we tell about animals and the steps we take to care for them and their habitat. That’s an amazing amount of power. We are excited to announce that we have added three new members to Nature Net network – be sure to visit them this summer! MMSD Planetarium: The Madison Metropolitan School District Planetarium provides immersive experiences for groups and public audiences, bringing out-of-this-world concepts down to Earth. A field trip destination for explorers of all ages, the Planetarium’s group programs are offered during the school day, but a limited number of after school and evening programs can be scheduled as well. Cave of the Mounds: Cave of the Mounds National Natural Landmark is the premier cave in the upper Midwest and the jewel box of America’s major show caves! Guided tours depart daily all year long – be sure to check the website for specifics, as the hours change in different seasons. Welty Environmental Center: The Welty Environmental Center in Beloit, WI offers year-round programs for all ages. The center is a place where both children and adults can gain hands-on encounters with biological, physical, and chemical elements of nature. Also, 2018 Nature Passports are out! They were distributed to all MMSD and Monona elementary schools and are available at all Nature Net member sites, but if you can’t locate one and would like one, be sure to let us know! Learn more or download here. Family Field Trips: Community GroundWorks is thrilled to offer Family Field Trips almost every Tuesday and Friday at Troy Kids’ Garden and Goodman Youth Farm. Each field trip will feature hands-on outdoor activities for parents and kids of all ages: harvest and cook a healthy snack, plant seedlings, explore the worm compost bins, or create outdoor art. Learn more here! Olbrich Gardens Summer Concert Series: Every Tuesday at 7 PM through August 4th, enjoy the summer evening with a concert on the Great Lawn of Olbrich’s outdoor gardens. A wide variety of music is highlighted, including folk, soul, jazz, classical, and much more. A $2 admission donation is suggested. Learn more here! Walks @ UW Arboretum: The Arboretum offers tons of free guided nature walks throughout the summer. Some themes include “Identifying Summer Prairie Flowers,” “Insects Galore,” and “In Search of Butterflies.” Check their calendar for more! Keeper Talks @ International Crane Foundation: Want to learn about the behind-the-scenes work done to care for cranes? Stop by the Crane Foundation headquarters on the first and third Sunday from July through September at 1:00 p.m. for a presentation by aviculture staff. Recurring Events @ Madison Children’s Museum: There are SO many events occurring at MCM every day such as “Animal Feeding,” “Cabin Crafts,” “Insect Scavenger Hunt,” “Early Explorers Playground,” and so much more! Head to their website for more information. Did you know the Department of Public Instruction recently introduced newly revised standards for environmental education? The DPI website states, “The Wisconsin Standards for Environmental Literacy and Sustainability (ELS) have been adopted by the Wisconsin State Superintendent for school districts, educator preparation programs, and non-formal environmental education centers to consider in their work with environmental education.” The new standards not only identify what students should know, but also offers inspiration for integrating environmental education into all subject areas. Connect encourages students to develop a sense of place and explore new perspectives and mental models, while encouraging curiosity and wonder. Explore helps students understand how ecological principles of networks, interdependence, diversity, and resilience are present in both natural and cultural systems. Engage suggests ways students can investigate concepts of dynamic balance between natural and cultural systems, and design and implement stewardship projects as active members of their community. Want to learn more? Meet DPI and Green Schools Network experts and delve deeper into Connect, Explore, Engage at the upcoming Annual Conference hosted by the Wisconsin Association for Environmental Education. Instill an appreciation of nature by leading by example, getting out there together, and using your own backyard as a place of exploration. Encourage conservation at home through action and advocacy. Introduce conservation concerns in a fun and interactive way, and encourage problem-solving and community-building. You can also take a few tips from the Rainy Day Sunny Play blog spot that suggests activities as simple as watching insects, observing birds, and visiting zoos (she also offers a few great reading suggestions). Have fun out there (and no more chocolate on the couch)!